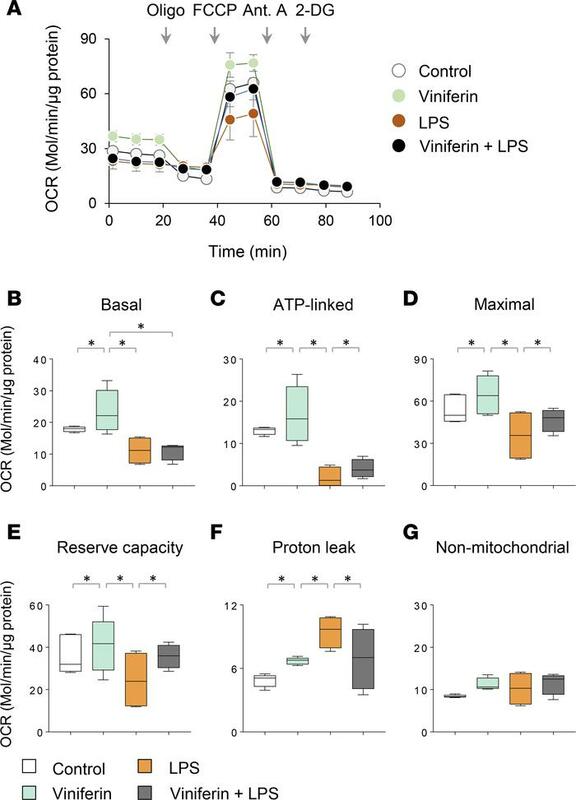 SIRT3 activation by viniferin modulates LPS-induced alterations in mitochondrial bioenergetics. (A) Representative traces showing the oxygen consumption rates (OCRs) in control and LPS-treated (3 ng/ml) macrophages. Oligo, oligomycin; FCCP, carbonyl cyanide-4-(trifluoromethoxy)phenylhydrazone; ant. A, antimycin A; 2-DG, 2-deoxyglucose. Cells were incubated with or without viniferin (1 μM) for 8 hours and then incubated with LPS for an additional 16 hours. (B–G) Indices of mitochondrial function, including (B) basal, (C) ATP linked, (D) maximal, (E) reserve capacity, (F) proton leak, and (G) non-mitochondrial OCRs. Data presented as mean ± SEM (n = 4). *P < 0.05 (ANOVA).